Martini recipes so delicious that maybe even the men will brave sitting at a table..alone…with a martini in front of him. And why not? They’re delish! 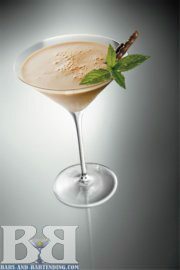 If you learned about martinis from James Bond movies, you remember that he likes his martinis shaken rather than stirred. Most martini drinks served in martini glasses are built this way – by adding ice and ingredients to a shaker tin, mixing and straining. To make the best martini you can, chill the martini glass while you’re building the drink – this will keep the drink nice and cold for your guests. Other than using a martini or rocks glass, the only other thing that changes are the ingredients that go into the shaker tin and the garnish that accompanies the martini. Click here for a video on the How to Shake & Strain and How to Chill a Glass. 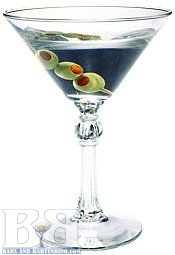 Note: For the Dirty Martini Recipe add 1 oz of olive juice.For a Dry Martini, swirl vermouth in martini glass and pour out before adding the Gin or Vodka.An Extra Dry Martini is a drop of scotch swirled in the glass and then poured out. Garnish with a raspberry or cherry and enjoy! You can check out our other pages on Drink Recipes, like Cocktail, Shooter Recipes, Mixed Drinks, Non-Alcoholic Drink Recipes, And everybody’s favourite Tequila Recipes. We also have Video Tutorials on how to make popular drink recipes like the Cosmopolitan, White Russian, Blue Hawaiian, Kamikaze, Hurricane, and the Bloody Caesar.